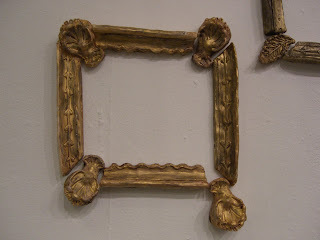 This was the final result of my second sculpture project this semester- I was very inerested in old, ornate picture frames (http://theorangefedora.blogspot.com/search/label/frames) that you see in museums. 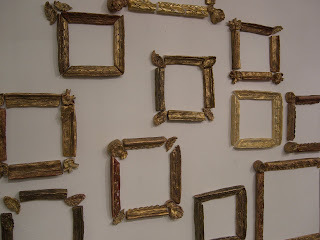 The frames are so intricate and were all handcarved, yet the maker is never given credit. I left my frames empty to draw attention to the handiwork that goes into this craft, and also to question why, in our society, whatever is put in a frame is instantly elevated to the status of ‘art’. Made from plaster using the blanket-mold process, the multiplicity and apparent mass-production (hah!) 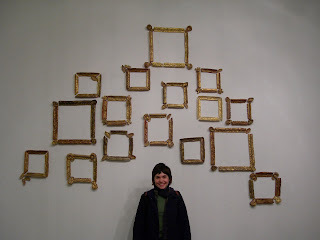 of my frames is also in contradiction to the uniqueness of the original handcarved pieces. This project was an unbelievable amount of work- after creating a model of each piece from clay and making a rubber mold, each section of the frames had to be cast, baked, sanded, shellac-ed, painted brown, painted gold and then rubbed over with shoe polish for the aged look.